SINGAPORE - Retired seamstress Song Hiang Kong, 81, learnt how to grow vegetables from her mother when she was growing up in Malaysia. She got a chance to grow vegetables again two months ago, when she applied for a garden plot at Punggol Park under a new National Parks Board (NParks) scheme. Madam Song is one of 110 gardeners who have secured an Allotment Garden plot in Punggol Park, which each consists of a 2.5 sq m raised planter bed. The scheme was rolled out from the end of last year, to provide space for community gardeners to grow their own plants and is part of the Edible Horticulture Masterplan. The plots are available on a first come first served basis and all 620 plots across 10 parks are fully subscribed. Another 340 plots will be available for application in Ang Mo Kio Garden West and Jurong Lake Gardens West later this year. Madam Song applied together with a neighbour, Mr Ng Chai Hiak, 58, and each have their own plots growing a variety of fruits and vegetables such as caixin, red spinach and radish. She takes the bus ride twice a day from her home in Sengkang to tend to her plants. "My grandchildren have grown up, so I'm free to pursue my hobbies now", she said. Mr Ng, a semi-retired purchasing officer who had previously tried unsuccessfully to get a gardening plot in a commercial farm off Sembawang Road, is happy to finally have his own green space. "Even when the monthly rental raised from $200 to to $400 per plot, it was still oversubscribed," he said, referring to the plot in the farm. Gardeners like Mr Ng each pay $57 a year to NParks for the allotment garden. A close-knit group of gardeners has sprung up in Punggol Park. "Everyone is friends here," Madam Song said. The gardeners share seeds and gardening supplies as well as advice freely. A WhatsApp group for the Punggol Park gardeners has more than 70 members, who share tips, organise bulk-purchases of supplies, or offer their extra seeds and plants. Some also use the group to ask for weather updates, or help to water their plants when they travel. Housewife Geraldine Ng, 57, who has a plot as well, said gardeners are generous people, and "the more you give, the more you receive". "It's the same principle as plants. You cut a plant to give someone, and two shoots will sprout up from where you cut," she said, adding a gardener in his 70s once visited the gardens and shared advice. 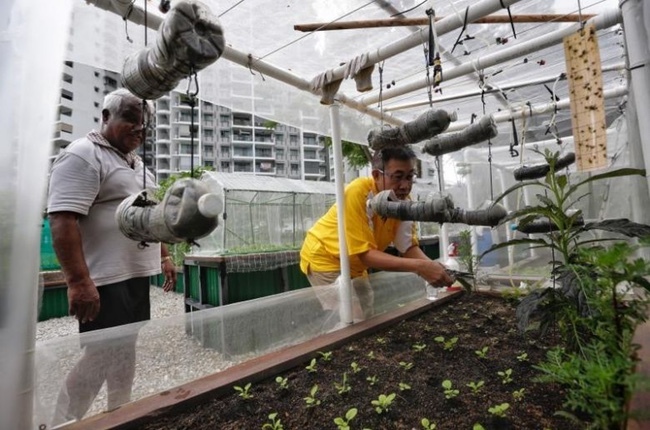 "He has an award-winning community garden in Tampines, which a few of us arranged to visit too," she said. Novice gardener Zhou Ye, 38, learnt how to grow plants from other gardeners and online resources and has harvested more than 20 bitter gourds, which the housewife shared with others. For some, gardening is a family affair. Engineer Marc Liang, 43, tends to his plot in Punggol Park on weekends with his nine-year old son and three-year-old daughter . He said it is a good way to bond with the family and rediscover his childhood hobby - he had helped his grandparents with gardening in their "kampung days". The project is also a chance for the gardeners to show off their resourcefulness and creativity. Mr Ng and a few others purchased pipes and nets to set up an enclosed plot to keep flies out. They also have an irrigation system with a network of tubes to water the plants automatically at intervals. "Everyone has their own way of being creative," said Madam Zhou, who built a multi-tiered garden with bamboo poles. Her bitter gourd plants, which are creepers, grow above a vegetable plot. She also has a mini vertical garden with three shelves of herbs. The allotment gardens have also drawn non-gardeners like retired police officer Steven Balakrishnan, 73, who visits about once a week after his exercise in the park. The scheme, however, is not without issues. Administrative officer Florence Ho, 50, said some people used the names of their friends or family to apply for more than one plot. Each household can apply for only one plot. "It deprives others of a chance to get a plot," she said. But there is no mistaking the enthusiasm for the scheme, with gardening communities sprouting up across Singapore as a result. Tax analyst Erwin Galang, 45, is one of 50 gardeners at Sengkang Riverside Park. He said they help to water one another's plots. "We also shared advice on how to make our own organic fertiliser," he said. Meanwhile, Madam Song has already harvested two batches of kangkong, which she cooked for her family, including her four grandchildren. "I was happy when I got my first harvest of course," she said.